Canadian eye health and vision care comprise mainly of optometrists. They are vital for the diagnosis and treatment of eye defects and diseases. They are the first point of call for patients who have eye problems. An optometrist is responsible for counseling patients, prescribing drugs, providing low vision rehabilitation and vision therapy as well as prescribing fitting eye lenses and glasses. Aside from these, they also perform a thorough eye exam. Such a review is capable of detecting eye defects like cataract and glaucoma and other associating problems such as high blood pressure and diabetes. To be able to identify sight loss, vision impairment, a comprehensive eye examination is vital for establishing an optimal treatment and care plan. Among all the dreadful ailment, the loss of vision is particularly dreaded among Canadians. Thus, they have ranked the maintenance of a healthy vision and the prevention of vision loss among their health properties. Poor eyesight causes a limited performance among school children, increased cases of absence from school and unemployable adults. It is also associated with frequent falls, depression, and social isolation in seniors. About 75% of vision loss is avoidable, treatable and even preventable. Most eye problems have no early signs, hence; they ought to be detected early. 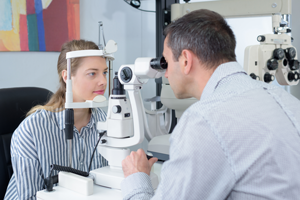 An optometrist can help you to diagnose these common eye problems that can also be detected with a comprehensive eye exam, while they refer patients to medical experts for appropriate care. Promote a system that is focused on the patient’s health needs by fully utilizing their skills, the scope of knowledge and practice. To provide insight to the general public regarding the value of eye exams in the prevention of vision loss and promotion of eye health through campaigns. To acquire their professional designation, Doctor of Optometry (OD), doctors are required to undergo seven to eight years of post-secondary education. And it has the following requirements. A minimum of three years of undergraduate education, preferably in the sciences; Please NOTE: In Québec two years of CEGEP is accepted at the undergraduate level. A degree program in optometry, usually four to five years. Endorsed by the Accreditation Council on Optometric Education. However, upon completion of their Doctor of Optometry degree; several optometrists prefer to go for an additional year of residency training. After completing their graduate courses in optometry, a graduate of optometry is required to meet up with the standards of the provincial board, in the territory he hopes to practice in, and this is combined with an examination conducted by the Optometry Examining Board of Canada. And acquiring a license to this effect. This will ensure the optometrist becomes capable of caring for the vision challenges of the people. Would you like to consult with one of our qualified optometrists, book your consultation today at our 360 Eyecare location in the Beaches, Toronto.